Imagine soft, moist chocolate cake covered with creamy, chocolate frosting. 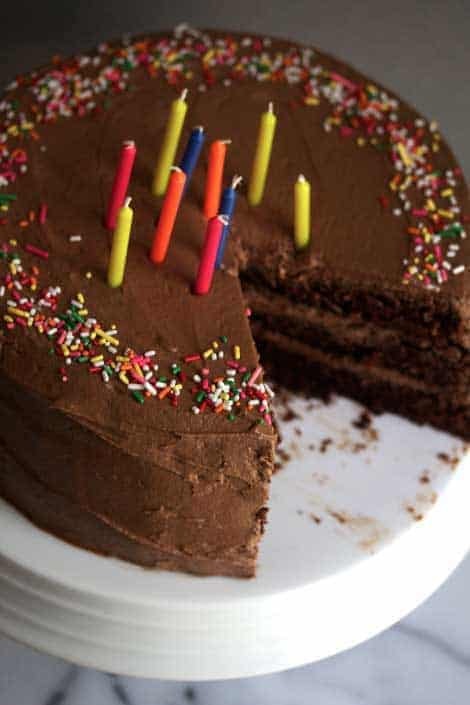 Open your eyes to the decadence and deliciousness that is this chocolate birthday cake with chocolate frosting! 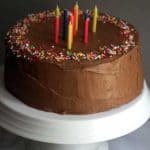 My husband is responsible for the recipe behind this Chocolate Birthday Cake. More than a decade ago, back when he and I were just dating, I asked him what kind of cake he wanted me to bake for him for his birthday. He told me he loves chocolate cake with chocolate frosting. I initially thought how simple can you get because I figured he would ask me for some extravagant and other worldly cake concept, but I was pleasantly surprised at the request. So, I made him the chocolate cake with chocolate frosting, and I surprised him at his apartment while screaming Happy Birthday! I was always great at surprises and this one took the… umm cake? This is one tradition that has stuck around. I make this cake for my husband for his birthday almost every year. I could eat this cake everyday but I think my thighs are seriously protesting that very thought. I’m glad I only make this cake once a year for the hubby. You get to lick the bowl once you’re done! The secret to making an outstanding homemade chocolate frosting is to make it fluffy. The key to fluffy frosting is to continue to mix the ingredients (butter, confectioner’s sugar, cocoa powder, milk and vanilla extract) on a high speed. This will ensure your chocolate frosting is fluffy. Whatever topper you decide, your cake is complete. Get ready to surprise the birthday boy or girl! Try my Ultimate Chocolate Pound Cake recipe. It is decadent and insanely delicious. Want chocolate cake in cupcake form? These Perfect Chocolate Cupcakes are amazing! Want the best chocolate cake recipe that ever existed? This Chocolate Cake with a blackberry buttercream is decadent and insanely delicious. Love berries and chocolate like this recipe? Try my Raspberry Chocolate Cake! 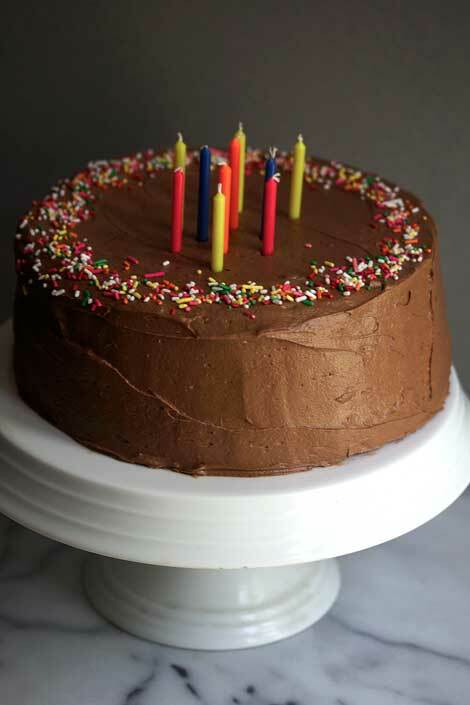 Soft, moist, decadent chocolate cake covered with creamy, delicious chocolate frosting...that perfectly describes this chocolate birthday cake! Preheat oven to 350 degrees and spray 3 9 inch round pans with non-stick baking spray. Add eggs and sugar to bowl of your stand mixer and beat on high speed for 2-3 minutes. While mixture beats, add cocoa powder, instant coffee powder and salt to hot water. Add to eggs and sugar. Next slow down mixer and add flour, baking soda, and baking powder then add vegetable oil, buttermilk and vanilla extract to the mixer and beat until just combined. Batter will be sort of thin but this is normal. Evenly add cake batter to all three pans and bake for 22-25 minutes or until a toothpick inserted in the center comes out clean. Allow to rest for 10 minutes before removing from pans to cool completely. Add butter, confectioner's sugar and cocoa powder to bowl of mixer and mix on high speed until smooth. Lastly add in vanilla extract and milk until frosting is fluffy and smooth. Frost each layer of cake with frosting then frost the entire cake and serve. I’d like to know your thoughts on a substitution for the 1/2 cup of oil. I’m on WW and always leave the oil out and use a substitute, i.e. 100% natural applesauce. Suggestions please for other options. LOVE your recipes and site♥️! Thanks so much Pam. You can definitely use the applesauce as a sub. The texture won’t be the same and neither will the moistness but Let me know how it turns out. 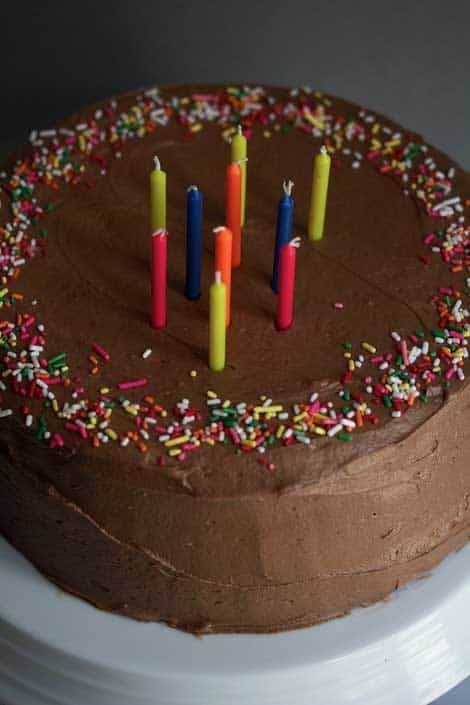 My name is Raushan and I run an online cake website (https://www.doorstepcake.com/) where I sell all types of cakes for all occasions like birthday, anniversary and so on. I like exploring websites like yours for latest and cool recipes and make delicious cakes. Thanks for sharing your ideas with us. Dear Jocelyn, thank you so much for sharing your receips! Could you tell the approx. weight of this cake, please?